National Dine Out Day - TOMORROW - Dine for a cause! MasterCard recently launched their Dine and Be Generous campaign supporting Stand Up To Cancer. From July 10, through September 28, 2012, when cardholders spend $10 or more for a meal on their card, MasterCard will donate up to $4 million to Stand Up To Cancer – one precious cent at a time. 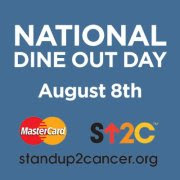 Tomorrow, Wednesday, August 8th, MasterCard is hosting a National Dine Out Day For one day only, MasterCard is doubling their donation from 1¢ to 2¢ to Stand Up To Cancer when cardholders dine out using their MasterCard card and spend more than $10. Additionally, MasterCard is teaming up with celebrity chefs Marcus Samuelsson and Rocco DiSpirito to help support National Dine Out Day. From 12 – 2 PM EST on August 8th, Samuelsson and DiSpirito will take over the @MasterCard Twitter handle to answer questions and discuss their backgrounds, experiences, opinions and recommendations as it relates to food & dining. We encourage you and your readers to login to Twitter tomorrow from 12 – 2 PM EST and take part in the conversation. And if you are dining out tomorrow, don’t forget to use your MasterCard.